The Jahanke are descendants of the Soninke. They live in what are called Jahanke villages, located mainly in Gambia and Senegal, but also across the border in Guinea. Although their specific location in Guinea is not known, they are assumed to live near the northern border, touching Senegal. Dwelling among the much larger Mandinka population, most of the Jahanke speak Mandinka as a second language. Their native language, Azer, is usually spoken at home. 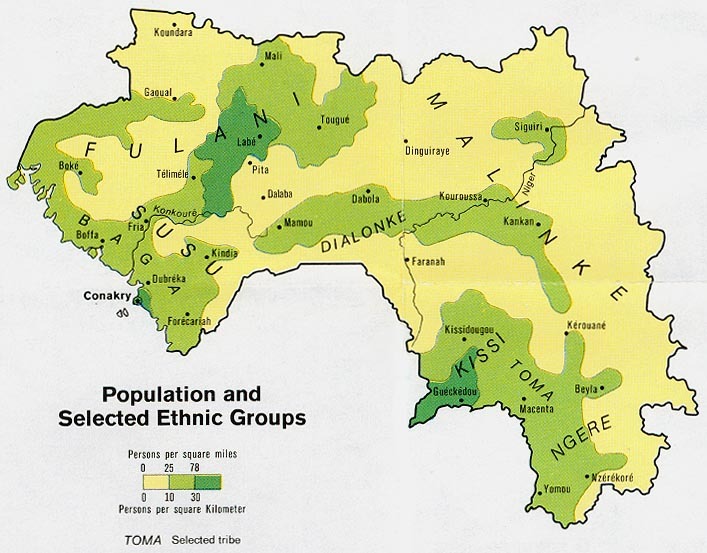 The nation of Guinea contains many diverse ethnic groups. As a result, the country has eight national languages: Malinke, Susu, Fulani, Kissi, Basari, Loma, Koniagi, and Kpelle. The most numerous of the people groups, the Fulani, are concentrated mainly in the Fouta Djallon region and make up about one-third of the population. The other major groups are members of the Mande group. They include the Malinke of northeastern Guinea (about one-third) and the Susu of the coastal area (about one-fifth). The mineral wealth of Guinea makes the economy of the country potentially one of the strongest in Africa. More than one-fourth of the known reserves of high-grade bauxite ore is found there. Sizable deposits of iron ore also exist. Other known mineral resources include diamonds, gold, cobalt, nickel, uranium, petroleum, and platinum. However, this potential wealth has not yet been developed, and the quality of life is still very poor. The chief economic activity of Guinea is agriculture, with the great majorty of the people dependent on farming. Most ethnic groups grow a variety of crops, using very basic tools. Maize, manioc, and rice are the staples, but squash, melons, sweet potatoes, peppers, and tomatoes are also grown. Major tree crops include bananas, coconuts, mangoes, and papayas. Cattle, sheep, and goats are raised, but their milk is not used. Dogs and chickens are seen in almost every village. Hunting is of less importance than farming, and there is gathering of wild fruits and roots; berries; and kola, shea, and palm nuts. Although the Jahanke are small in number, they are a very significant group. They are virtually all Muslim and in the past, were very highly regarded Muslim scholars. Formerly, they supported themselves through their activities as religious teachers; however, when they lost their slaves in this century, they were forced to devote more time to farming and less time to religious studies. Nevertheless, many are still active Muslim teachers. The Jahanke claim to be descendants of a great fifteenth century West African cleric. Their Muslim tradition avoids the notion of jihad (holy war) in favor of pacifism, and they feel no need to convert others to Islam. The Jahanke value education and scholarship and are known for their success in commerce and other professions. However, as urbanization has accelerated in recent years, the Jahanke have become more dispersed, and the pressures of modernization have become more acute. The great majority of the population of Guinea is Muslim, but many still follow traditional ethnic beliefs. Christians form only a very small portion of the total population. The Jahanke are virtually all Malikite Muslims. As such, they follow the teachings of the prophet Mohammed. Their Muslim religion is a religion of works based on five "pillars," or duties. These include affirming that "there is no god but Allah, and Mohammed is his prophet," praying five times a day, giving alms to the poor, fasting during certain times, and making a pilgrimage to Mecca. There are few if any Christians among the Jahanke and few Christian resources in their language. Conversions among them would greatly impact the general Muslim community in Guinea. Perhaps Christian educators and professionals who could present the Gospel in culturally relevant ways would be one avenue to reach the Jahanke. * Scripture Prayers for the Jahanka in Guinea. * Ask the Lord to send missionaries to share the Good News with the Jahanke of Guinea. * Pray that God will call Christian educators and professionals to minister the love of Jesus to the Jahanke. * Ask the Lord to save key leaders among the Jahanke who will boldly declare the Gospel. * Pray that strong local churches will be raised up among the Jahanke.